I think that we’ve all noticed the Wi-Fi tethering option which smartphones offer. However, what if I told you that you can do the same thing with your computer? Interested in learning how to do it? Then keep on reading. Before moving on, you need to first make sure that your computer has the ability to become a Wi-Fi router in the first place. To do that, open the command prompt, and type “netsh WLAN show drivers”. A list will appear, and one line should say “Hosted Network Supported”. If it says, “Hosted Network Supported: Yes”, then you’re good to go and carry on with the guide. My Computer Doesn’t Support Hosting – Now What? In that case, there’s no need to worry. There is a solution. You see, the part of your computer that doesn’t support this feature is your network adapter/card. That’s really all there is to it. You just plug it into one of your USB ports, install any drivers if the adapter requires you to do so, and you’re good to go. As for which one to choose, it comes down to personal preference. You can see a list of network adapters over here. And one last thing. Before moving on, you might want to test your network adapter to ensure that you’re taking full advantage of your connection. The hard part is over now. After everything is setup, we can go ahead and transform our computer into a router. To do that, we can either use the default Windows options or a 3rd party program. Windows 10 allows you to use your computer as a router by default. To enable it, go to your Settings-> Network and Internet-> Mobile Hotspot. That’s the main control panel of your computer router. You can change its name, password, main network, etc. That’s all there is to it. You just enable the hotspot, and you’re ready to use it as a normal Wi-Fi with any of your devices. This program is open source and completely free. You have the option to donate a buck or two to the developer, but the program remains free without any ads. An honorable mention is that without ads, there is absolutely no tracking at all. And that’s a good thing for our privacy and sanity, no one likes watching ads. Virtual router officially supports Windows 7 and Windows 8, but it should also be compatible with Windows 10. It works with any type of connection (Ethernet, Wi-Fi, Dial-Up, etc) and any type of device which can connect to a wireless access point. There is almost no need to mention that it uses WPA2 encryption which there is no way to turn off. It’s an effective way to ensure that your shared network stays safe. Unless you enter a password such as 12345678, your pet’s name, or anything like that. While not as widely used as Virtual Router, MyPublicWiFi is still a viable option as it’s also free and offers a couple of features which might come in handy. The UI is simple and easy to navigate through. And just like our previous options, this program allows pretty much any kind of device which supports Wi-Fi to connect to your hotspot. Other than that, you have the ability to see how many people are connected to your network, and what websites they are visiting. You also have the option of blocking file sharing to enhance your security a tiny bit. And of course, changing the name and password of your network is entirely possible. This is the only paid program and it absolutely takes networking to a whole new level with a bunch of features and options. To my understanding, Connectify also features a free version which only supports the basic hotspot features. The paid version, or the MAX version, as Connectify likes to call it, offers additional features such as a 3G/4G hotspot, Ethernet hotspot, Wi-Fi repeater, bridging mode, and custom IP controls. Some network adapters are not able to act as both a receiver and a transmitter at the same time. Which means that you might not be able to tether your Wi-Fi connection. 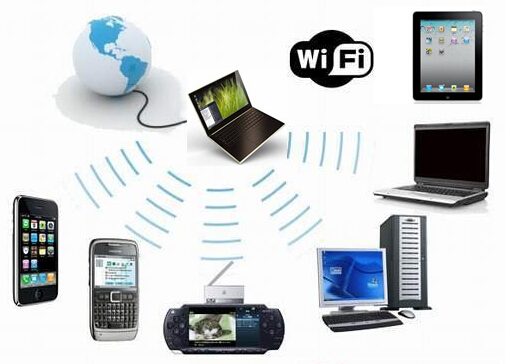 Some people tether their Wi-Fi connection to increase the range as they have both the computer and the actual router acting as transmitters. If you want to do that and your network card doesn’t support it, then your best bet is to replace it with a new one which does.